With the BlackBerry Z10 now hitting the market, many folks picking the device up have been wondering why they can no longer use their BlackBerry provided BlackBerry.net email addresses. Instead, the setup process of those emails on BlackBerry 10 simply states the email accounts no longer supported through the device. If you're not familiar with these email accounts, they were once offered by BlackBerry to those making use of a BlackBerry smartphone. Normally, they would carry some carrier association with them. (e.g. : user@rogers.blackberry.net.) For some, it has been the only email address they've known despite the multitude of email providers available out there. So, what's BlackBerry doing with those accounts? We now know the answer, thanks to b320! Overview: BlackBerry email addresses are usually in the format user@<serviceprovider>.blackberry.com/net. 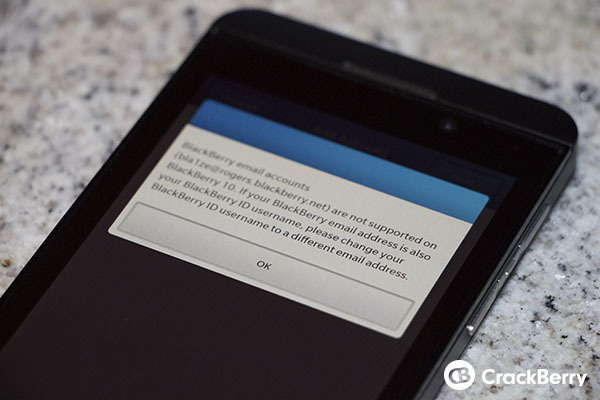 When a BlackBerry email address is moved to a BlackBerry 10 smartphone, email messages from the BlackBerry email address can be forwarded to the new email address for one year. NOTE: The one year of email forwarding cannot be extended. When using a BlackBerry email address as the BlackBerry ID username, it is strongly recommended to login and change the BlackBerry ID username to the email address that messages are being forwarded to. Follow the steps below to configure forwarding and to change the BlackBerry ID username. NOTE: Moving forward please use the new email address when signing into BlackBerry ID.